Card #4 Capsule on Moon shows many happy green aliens greeting a capsule that has landed on the Moon. The capsule sits on a lunar landscape filled with craters and mountains, with the Earth and a bright shining star in the background. Coming out of the capsule is Santa Claus carrying a bag of toys and a Christmas tree. Ruldolph the Red Nosed Reindeer is peaking his head out the capsule door. 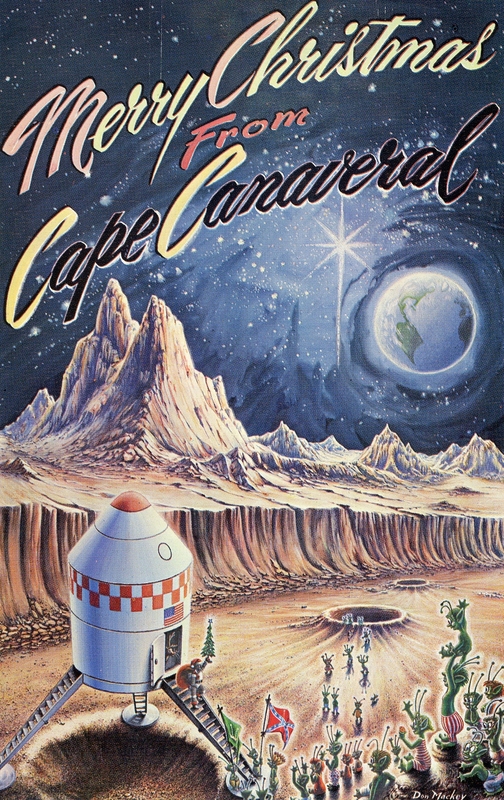 The greeting on the card says, “Merry Christmas from Cape Canaveral”. Christmas card from the 1960s and 1970s by NASA space artist Don Mackey. Card purchased on eBay.